Inclusive of its roles in due diligence and related advisory activities, Ernst & Young topped by deal volume advising $41.8 Billion (across 57 deals). 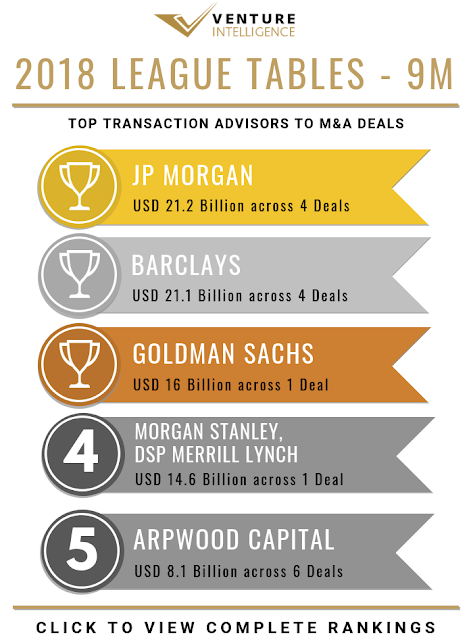 JP Morgan took the second spot advising $35.8 Billion (5 deals), followed by Barclays ($21.1 Billion). EY also topped by deal volume, followed by KPMG at second place with 23 deals (worth $11 Billion). Deloitte came in at third with 14 deals (worth $3.2 Billion). Barclays, Credit Suisse, Evercore, JP Morgan and UBS acted as financial advisors to UPL Corp's $4.2 Billion acquisition of Arysta Lifescience. Kotak advised the $1.1 Billion Excel Crop Care and Sumitomo Chemicals merger.